Following the Magnitude 5.7Ml (5.3Mw) earthquake in the Lake Muir region of WA on Sunday the 16th of September at 12:56 (WAST), Geoscience Australia mobilised a multidisciplinary team to coordinate and deploy temporary seismic and geodesy monitoring equipment around the Mainshock area. A two person team from Geoscience Australia flew to the region the next day, and deployed the first seismic and geodesy monitoring sites on the Tuesday. Following this a further 4 seismic monitoring and 2 geodetic monitoring sites were deployed, surrounding the suspected epicentre location by the end of the week. 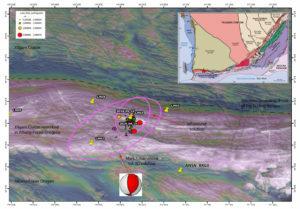 Seismic monitoring sites include: 4 sites with a Nanometrics Centaur digitiser with Lennartz 3D lite short period seismometer and a Nanometrics Titan accelerometer. The 5th seismic monitoring site has a Nanometrics Centaur digitiser and a Nanometrics Trillium Compact 120s broadband seismometer. All sites are currently working well and the seismic data is streaming in near real time to GA at 200sps. This is a first for aftershock monitoring deployed in Australia with telemetered near real time high sample data and aftershock locations. The deployment will likely remain out until November or until activity reduces. Image shows both the mainshock location and the revised 3D mainshock location using additional infrasound station data, along with the station locations, aftershock locations and a background of geology for context. Follow the links to Twitter videos from the deployment and getting kit ready.